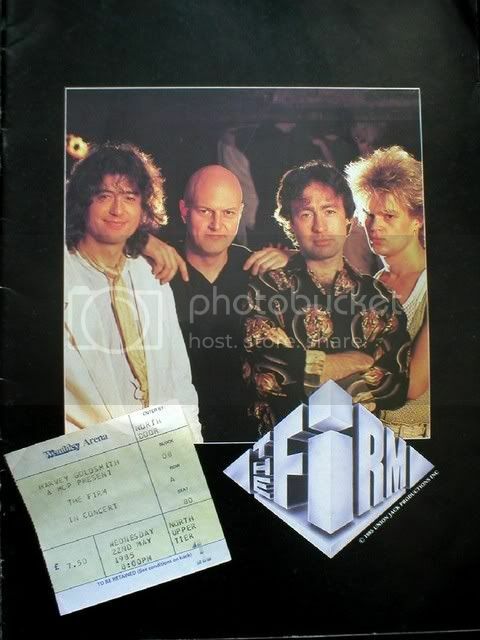 I have seen pretty much every major band one can name and to this day, the best show I've ever seen was on te Firm's Mean Business tour in 1986. I still think the 2nd LP is extremely under-rated and the power-force of Page & Rodgers when shamefully unnoticed. Perhaps the time just wasn't right. I remember being thrilled to see Jimmy with the bow and the green laser pyramid. Virginia Woolf, with Jason Bonham, also opened the show - for a young, budding Zephead, I was very happy! I remember Jason's opening band. I was quite disappointed at his drumming, but am thrilled to see that he's come far in these last 20 years. I also saw Jason drum for age on the Outrider tour. But that Firm concert was magic! The bow, the lasers, the duel with the bass player; I actually found a recording of a show from that tour on Ebay. It sounds just as good as I remembered it. I'm probably the only person on Earth who is still waiting for a third LP from the Firm!! I think The Firm's 2nd album is terrible and there are only a few standouts on the 1st. It's all because of the songwriting. I think Jimmy gave Paul too much creative license. Coverdale/Page blows away both Firm albums. I believe you're right about the timing. It just wasn't right. The biggest reason The Firm failed is twofold. The mundane, boring 80's thudding of Chris Slade, and Rodgers' pop-inspired songwriting. Jimmy played like a man posessed though, and Tony Franklin was a decent bassist. And Rodgers' vocals were fine. I like The Firm overall though. For all those who say Jimmy has been "phoning it in" since the demise of Zep, I say you're mistaken. The guitarwork with The Firm and Coverversion/Page is excellent, particularly the latter. I really enjoyed Coverdale/page when it came out , and was hoping they would do more . I was kind of young when the Firm was around , but still remember the song 'Radioactive' . I thought it was a fairly good song . Obviously none of his post-zep stuff will ever touch what he did with the group , but I think he still has some really good music otherwise . I probably more more value on the Firm than deserves because of sentimental value. I grew up in the 80s and we played those Firm LPs constantly, so when I listen now, they tke me back to those teenage years. In those days, all we had were the Zep LPs. We didn't have good bootlegs, BBC live recordings, internet info. So anything that Page did was "new Zep" for us. Ju being able to see what Jimmy looked like and played like. But the real treat of the Firm is in the song Midnight Moonlight. The acoustic guitar intro is the intro he originally created for the opening of Kashmir but left it off. As for Outrider, I waited in line at the record store for hour waiting for it. The other folks were waiting for the new Steve Winwood and made fun of me saying that the Page LP would be in the bargain bin in a week! But back then, a Page solo album was about as exciting as it got! I was actually less than thrilled with most of it. The collaboration with Plant was dissapointing, the instrumentals were boring and I personally didn't enjoy the singers. I have maybe 2 favorite songs from the Firm years, and that is "Radioactive" and "Satisfaction Guarantee" (probably misspelled that). But I have "Outrider" CD and can't stand to listen to it, except the instrumental songs that is just Jimmy playing. I like both The Firm albums/CDs equally. However, the song “All the Kings Horses” from Mean Business (album/CD), the ending piano part is almost identical to the ending of Bad Company’s “Running with the Pack” from Run with the Pack (album/CD). I like Jimmy’s, Outrider album/CD a lot. I love the instrumental songs along with the blues songs “Hummingbird”, “Blues Anthem” and “Prison Blues” are ALL excellent! I especially love the guitar solo, in “Prison Blues”! I either heard or read that, “Prison Blues” was done in one take. “The Only One” with Robert singing in my opinion, sounds a lot like stuff they (Led Zeppelin) would have been doing at that time, had they not disbanded. I believe, I either heard or read that, Robert actually sang on two or three other tracks that were not included on the Outrider album/CD. Has anyone else heard or read this? I was at that show too- in the front row! I had brought a cheap little pocket camera & must have taken like 30 or 40 pics. Unfortunately most of them had a shot of the bald security guard that was standing in front of me, except for 1 beautiful pic of Jimmy playing the Les Paul during "The Chase" right in front of me. I'm 99% sure that the show I saw in April 86 at Nassau Coliseum was for the Mean Business tour - remember buying the vinyl LP and boning up on it before the show. Much of Midnight Moonlight- in fact, ALL of it musically- started off as "Swan Song", from the Physical Graffiti sessions. Jimmy just tacked on the acoustic guitar parts along with "White Summer" as an intro to Kashmir from 1977 on. I have the original "Swan Song" segments. I love the Firm's arrangement of the song, in fact it's my favorite Firm song. But you just have to hear the Zep demos. It would have been mind blowing, to put it mildly. There shoud've been a 3rd -the firm album... but then again, i'd much rather had seen a 2nd -page/plant album!! Saw them May 1st 85 and March 19th 86........both at the Capital Centre. I still remember them well. In 85 I bought the black shirt w/ the blue firm logo in the front.......in 86 I got the black shirt w/ Jimmy in the Stormtrooper getup on the front. Had REALLY good seats (like most of my Cap Centre shows back then as I had the ultimate hookup) It was really great...at the time. Sadly, today I can hardly make it through a Firm album....or Outrider for that matter. They just sound too damn dated. It's that dreaded 80's production value thing again! What I do listen to are the few choice sbd's from either tour, the pro recorded Westwood One show, and the outtakes and pre Firm XYZ session which is where a couple Firm tunes stemmed from. (this was the basement session that got Jimmy to pick up a guitar for the first time since Bonzo's death. Jimmy's neighbor Chris Squire (from Yes) talked Jimmy into coming out of his funk and the two along w/ Alan White did some jamming and kicked around w/ a handfull of tunes. Some made it into the Firm catelog, others wound up on Yes's comeback album 90210.
damn, i was at that show too! My dad took me to see the Firm in Dayton, Ohio. I was 15 at the time and it was a great show. I still listen to the 2 albums from time to time, but agree, Page's collaboration with Coverdale was more Zeppelinish, and I think Jimmy was in better health after kicking his habits. It's a shame that ticket sales were lack-luster for what was gonna be the North American Coverdale/Page tour. I have a Roy Harper disc from around the time the Firm were making the first album that has a few track with Page that are pretty good. I think thats right about Page giving Rogers to much license, thus the songs on that album were too sanitised !! I remember The arena being half full and feeling a bit down by this. I think they should have played somewhere smaller like Hammy Odeon, it also didn't help that Wembley Arena is just a crap place to see anybody. It was good to see Jimmy live for the first time, and the band were good live even if their albums were average. I remember being mesmerised by jimmy's violin bow/laser section. I love the 1st Firm album and was playing it in my van yesterday. In my eyes it's a classic. 2nd one was good but l don't find myself playing it much. Reference Paul Rodgers, i love Free and Bad Co, it was the 80's and l lot of eople at the time were trying to put 80's sounding records out. I find the 1st Firm album one of the better of the era. I also don't think Zep should take any credit for Midnight/Swansong. They should have recorded it but they didn't. I find Rodgers singing good and Franklins bass playing really good. I can't imagine Midnight Moonlight without that bass style. lot of people carry songs for years with putting them out. Coverdale / Page - I've tried and tried but l can't listen to it,sorry ..... rock by numbers to me .. boring!! I love Whitesnake and Coverdale. The last live cd was great, a fine return to form. Outrider was OK but again don't find myself playing it as much as Plant's stuff. I think Jimmy should revisit the first Firm album and remix it as the sounds a little off and redone it could sound stunning. Go on Jimmy, make a new year task !!!! Your entitled to your opinions, but C/P painting by numbers !! well I think it s some of Pages best guitar playing in years, and Take Me For a Little while, WOW its such a good song, anyway we are all different !! I'm probably the only person on Earth who is still waiting for a third LP from the Firm!! I couldn't disagree more about Coverdale/Page. The Firm albums have far more character than C/P. IMO that is the case where Page gave too much leeway. The lyrics on that album are completely unlistenable to me. I've had it for years and have barely been able to listen all the way through. Jimmy's playing is fast and clean and there are lots and lots of guitar-army overdubs, can't fault that, but the songs I just think are terrible. It doesn't help that at the time not many people could ignore the fact that it was like a slap in the face for Jimmy to collaborate with David Coverversion. That's why demand for the US tour was poor. The only thing worse was the Puff Daddy collabo. In retrospect the second Firm album is a bit bland, but also has some really awesome moments, like Fortune Hunter and Cadillac. The Firm suffers mainly in the lyric department, much like Coverversion/Page. But I'll tell you what, in 1986/87 I was listening to that second Firm album non-stop. I didn't find any fault with it at the time. One of my friends can't stop himself from singing 'couldn't put Humpty Dumty back together again' during All The Kings Horses. Now he's got me doing it. I think I tend to have more of a Pop sensibility than a Hard Rock sense, so that probably explains my affinity for The Firm over Coverdale/Page. I've never been into any L.A. Metal bands (not since Quiet Riot in the 5th grade, at least - somehow G'N'R doesn't count for me) I know Coverdale is English, but it's tough to distinguish him from that scene. The Firm fit nicely into it's time period. It's a distinguished chapter in Jimmy Page's catalog. C/P was too little too late. Hair Metal was already being replaced by Grunge. This was an embarrassing misstep, but luckily pushed Robert Plant over the edge to wanna work with Jimmy again and gave us the P/P collabo. As above, I agree very much about The Firm, but as for C/P good guitar work, but IMO horrible songs. It's like listening to Alcatrazz. I really like Tony Franklin's bass playing. Chris Slade... doesn't really strike me one way or the other. Can't really fault him, though. I hear ya. There was definitely a lot of excitement surrounding The Firm and Outrider. I see you've already been corrected on the origins of Midnight Moonlight. From the few shows I've heard The Firm was a great live band too. Anyone who ever saw them has said the same. The video I saw of the C/P tour in Japan is pretty painful, but Jimmy is covering all the guitar parts himself (including the Whitesnake numbers!). Too bad he forgot to practice White Summer.